People waxing lyrically about beautiful code and its sensibilities. People willing to trade the hard scientific measurements such as memory footprint and runtime speed for something so ephemeral as programmer happiness. And often that image is not entirely inaccurate. As 'Robert Martin' indicated, professionalism is a very important quality for software development (and I add - science and engineering in general). But as DHH asserts: 'the wonderful thing about this new age of programming is that we need and prosper from both types of programmers'. I agree with David. You really do need both types. And if you look back at some of the most impressive discoveries in science in the 20th century, there were artistic people involved, usually with the key discovery. I love the biggest deviation from the boring stereotype - Einstein, with his wild hair and almost chaotic appearance. It's all about thinking outside the box. David says it's all about 'programmer happiness'. Of course he's right too. 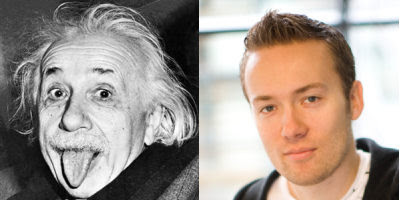 Now what about the irony that DHH's profile shot is so much more professional looking than Einstein's? Ah but David has wild hair too - it's all trendy and not slicked down with a button-up shirt all the way to his Adam's apple. ITSolusenz departments manage all components ITsolusenz.com of software development including,Application Development Company, software development company india, Software Development Services.